Your first donation will be charged today and then monthly starting on . Learn more about our monthly donor program and benefits. 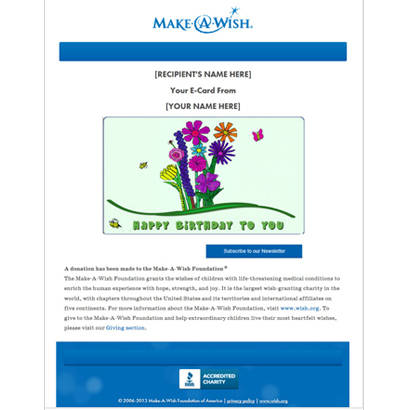 For tribute, memorial or celebratory donations, add a card, e-card or printable certificate! Please select how much you'd like to donate. Please select where to direct your donation. Title Please select Mr. Mrs. Ms. Miss Dr. Please confirm your email address. We want to make sure you get your email receipt. If this donation is on behalf of a company, school or other organization, please enter the name here. 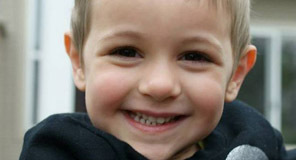 Donors receive periodic updates and communications from Make-A-Wish® and may unsubscribe at any time. You will be taken to PayPal to process your donation and be returned on completion. It is the intention of the Make-A-Wish Foundation® of America (the "Foundation") that any funds raised will be expended and/or distributed consistent with the original intent and wishes of the donor. However, notwithstanding the foregoing, the Foundation reserves the right to use and/or distribute the funds raised in whatever manner it deems appropriate, if, after reasonable review, the Foundation determines in its sole discretion that such funds are needed and/or would be better utilized in others ways in furtherance of Foundation's charitable mission. Is your country not on this list? 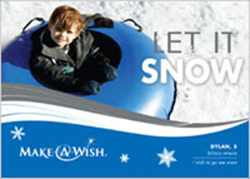 Select another country or donate to Make-A-Wish International. What is a card security code? The Card Security Code (CSC) is a 3- or 4-digit number printed on your credit card. It provides added security when you use your card on the Internet or over the phone. The number appears only on the card itself, not on receipts or statements. We ask for the CSC when you enter your payment information. This helps ensure that anyone making a donation to the Make-A-Wish Foundation has the card in his or her possession and is not using a stolen credit card number. Turn the card over and look at the signature box. You will find either the entire 16-digit credit card number or just the last 4 digits, followed by the 3-digit CSC. 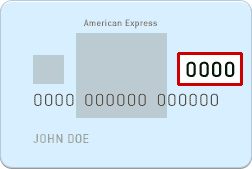 The CSC is always located above the account number on the face of the card, sometimes on the left side and sometimes on the right. 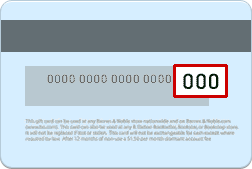 Note: Some American Express cards have a 4-digit number below the account number. This is not the CSC. Great satisfaction. 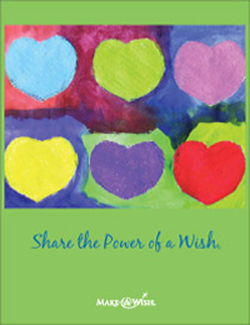 You will know you are helping wishes come true every month. Convenience. When you participate, your gift will be transferred and will appear each month on your credit card or checking account statement. Flexibility. If for any reason you wish to increase, decrease or suspend your gifts, just call (800) 722-9474, ext. 5420, and we will gladly accommodate you. Reduced paperwork and overhead expenses. 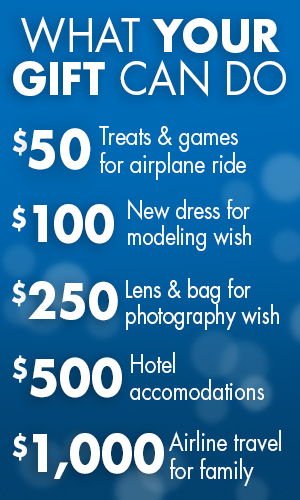 Automatic monthly payments mean more of your donation goes to granting wishes. Make-A-Wish calendar. You will receive a year of inspiring photos to warm your heart. Periodic updates. You'll get ongoing new stories and information via mail or email. 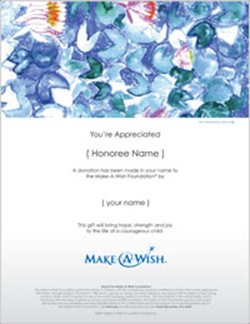 Thank You Certificate (Appreciation) Size: 8 1/2" X 11"
You print this certificate and mail it yourself. Your personalized certificate will be presented to you as soon as you have checked out. The tribute printable certificate is a full-color, Adobe Acrobat PDF document. It can be printed on your own printer and is attractive whether printed in color or black and white. You will need the free Adobe Acrobat Reader to view and print the certificate. Click here to view a test PDF document; this will tell you if you already have Acrobat Reader installed on your computer. Need help with Adobe Acrobat? Get Adobe Acrobat Reader | What is Adobe Acrobat? to the life of a courageous child. Oops! Tribute type is required. Oops! First name is required. Oops! Last name is required. Optional Tribute Name If left empty we will use the name as entered above. Your personal message will be included in the body of your e-mail, exactly as it is entered here. Limit 255 characters including spaces. Optional Message line 1 Optional Message line 2 Optional Message line 3 53 characters per line including spaces. Your message will be typeset exactly as it is entered here. Be sure to include your name if you wish the recipient to know that the card is from you. Oops! Please enter a name. Oops! Please enter an address. Oops! Please enter a city. Oops! State is not an appropriate choice. Oops! Please enter a postal code. EVERY WISH GRANTED CAN BE A TURNING POINT. DONATE NOW. Granting wishes to kids with life-threatening medical conditions gives them more than an amazing experience. A wish come true has the power to make kids feel stronger, more courageous, and more determined to overcome their illnesses. Many families and healthcare providers believe the wish experience is the turning point in a wish kid's battle against their illness. Your gift today can help Make-A-Wish® achieve our mission to grant the wish of every eligible child. Grant a wish and help change a child's life.